The staff was very friendly and accommodating. I had no problems reaching or getting my questions answered. Cool space. Clean and modern. Excellent property and great service. This was a very comfortable and easy stay. Cleanliness and updated decor. Comfy beds. Great location within walking distance to downtown and the beach. Decor was tasteful and updated. Beds were comfortable which is so important! Thank you! Very clean and modern but with a beach feel. 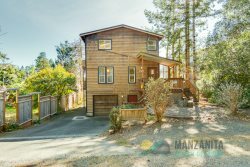 Working with members of the Manzanita Beach Getaway Team made the whole process easy. Have stayed at this location before. Was as expected. Everything went well. Place was clean. Good location. Enjoyed the stay at the Villarosa and Manzanita. Will be back again. The best! Tell us about your favorite feature of the property. Too many to list! The unique layout of the house, views from kitchen/dining/living room, claw foot tub, comfortable furniture and beds, overall grandma style with antiques, nooks, and colors - spacious yet so cozy!